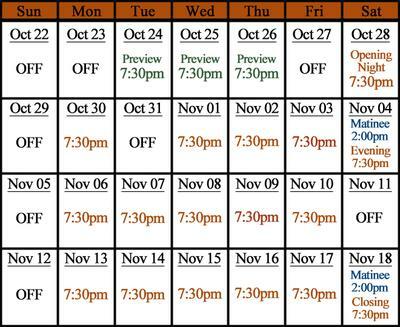 Shows run October 24 - November 18. 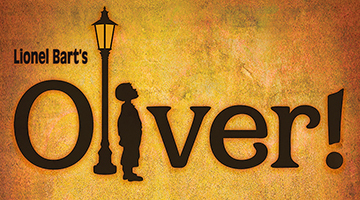 Lionel Bart’s musical “Oliver!” is based upon the Charles Dickens novel “Oliver Twist” and was the winner of three Tony Awards including Best Original Score. The streets of Victorian England come to life as Oliver, a malnourished orphan in a workhouse, becomes the neglected apprentice of an undertaker. Oliver escapes to London and finds acceptance amongst a group of petty thieves and pickpockets led by the elderly Fagin. When Oliver is captured for a theft that he did not commit, he is taken in by a kind and wealthy old gentleman. Fearing the safety of his hideout, Fagin employs the sinister Bill Sikes and the sympathetic Nancy to kidnap him back, threatening Oliver’s chances of discovering the true love of a family. Shows are at 7:30pm with two Saturday matinees at 2pm on Nov 4th & 18th. Shows run multiple days per week; dark every Sunday.